Jupiter and several of its moons hang over snowcapped Colorado peaks in this photo snapped by skywatcher Patrick Cullis on March 9, 2012. 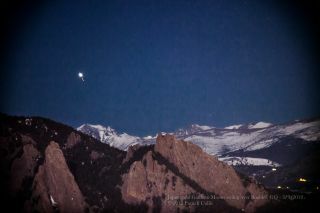 Jupiter and Venus streak through the sky above snowcapped Colorado peaks in a dazzling new skywatcher video. The one-minute video, created by amateur astronomer Patrick Cullis with footage he shot last week, shows the two bright planets setting behind the iconic Flatiron Mountains near the city of Boulder. "I'm especially happy with it because you can clearly see Jupiter's moons setting in formation with the giant gas planet," Cullis told SPACE.com in an email. The bulk of the footage was captured with two cameras and a telescope on March 8 and 9, he added. After creeping closer and closer together for months, Venus and Jupiter are now putting on a dynamic double show for skywatchers. The two planets — the brightest in the night sky — are now so close together that you can block out both of them with a few fingers held at arm's length. Somewhat confusingly, Jupiter and Venus also technically come into conjunction on Thursday (March 15), when they line up in another set of celestial coordinates. But they'll be slightly farther apart on that date than on Tuesday. Venus-Jupiter conjunctions happen just once every 13 months or so, and this one should be more spectacular than most, experts say. At mid-northern latitudes on Tuesday, the pair should be visible over the western horizon for several hours, with Venus blazing considerably more brightly than its planetary partner. Though Jupiter and Venus appear close together in the night sky these days, in reality they're nowhere near each other. Venus orbits the sun at a distance of roughly 67 million miles (108 million kilometers), while Jupiter is found about 484 million miles (779 million km) from our star. For comparison, Earth zips around the sun from about 93 million miles (150 million km) away. The orbits of Venus and Jupiter are separated by Earth, Mars and the main asteroid belt.